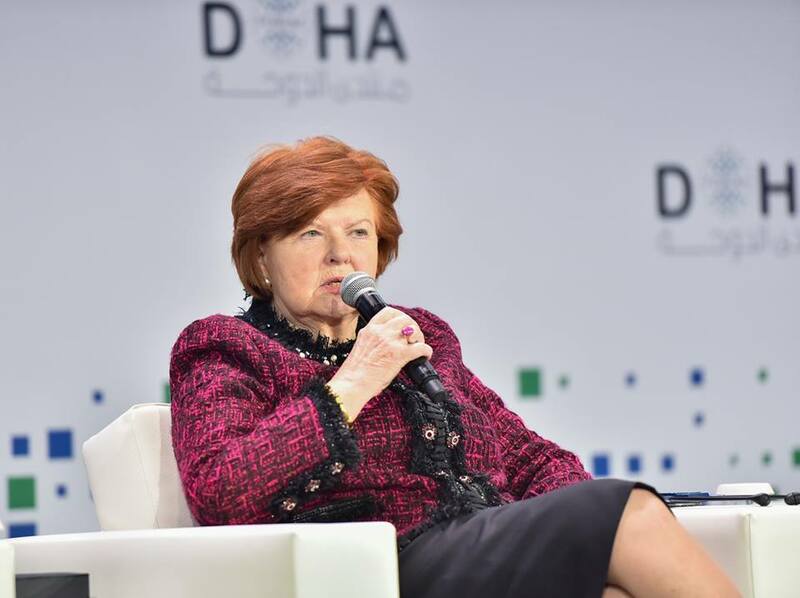 The President of the World Leadership Alliance – Club de Madrid, Vaira Vike-Freiberga, spoke at the Doha Forum 2018 in a plenary session that focused on the challenges to the implementation of the Sustainable Development Goals (SDGs). 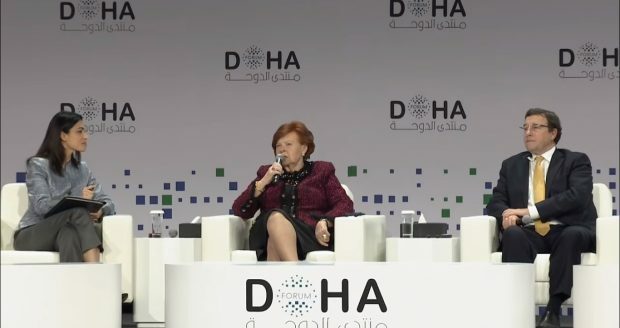 The session, which was structured in the form of an interview conducted by journalist Ghida Fakhry, taped into the governmental experience of Vike-Freiberga, former President of Latvia, and the insight of Ahrim Steiner, Administrator of the United Nations Development Programme (UNDP). The President of the WLA – Club de Madrid was part of an Independent Team of Advisors which provided recommendations based on strategic analysis regarding the changing role of the UN development system in light of the 2030 Agenda, the development program that is meant to implement the SDGs. “Our group discovered that the separation between investment in development and humanitarian aid is very fuzzy, it is very indistinct and it ruins the capability of UN institutions to make maximum use of the resources it has”, said Vaira Vike-Freiberga in the session. In his first intervention, Ahrim Steiner addressed the need to redirect current spending into areas that advance the SDGs, to which Vike-Freiberga added that to “finance won’t do the job alone”. Achieving Agenda 2030, said Vike-Freiberga, “takes commitment and belief in the ability of the human race to sustain a planet that it will not self-destroy, but that will continue to thrive and develop”. There is no doubt that the adoption of Agenda 2030 by 193 UN Member states was a significant achievement by itself. But when we take a look at its implementation, there is much more room for doubt. “It would take a bold soul to claim that all nations sitting at the UN General Assembly have hearts beating at the same rhythms and minds committed to the same ideals”, said Vaira Vike-Freiberga. Casting a shadow over Agenda 2030 implementation, Ghida Fakhry asked if states had felt “diplomatically compelled” to sign on the SDGs, the former President of Latvia added that “it is a sovereign right of each country to decide whether they follow the path and how well they follow the path”. The disruptive effect of technology often leads us to debate its role in development. In an age of accelerating technological development, unequal access to technology can generate all sorts of divides. But as technology improves, said Vaira Vike-Freiberga, its ability to reach more people also improves. “Modern technologies will allow people in remote areas to have access to education. If you couldn’t bring teachers to the students, technology can bring them the information that they need”, said the President of the WLA – Club de Madrid. Consequently, according to the global leader, countries that are facing illiteracy problems “need not follow every step that other countries have taken centuries to traverse”. 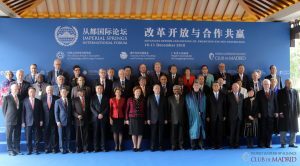 Having just attended a few days ago our 2018 Imperial Springs International Forum, the President of the WLA – Club de Madrid brought some of the issues discussed in Guangzhou to the Doha Forum. She highlighted the need to reform the World Trade Organization and the financial system, saying that she personally believes that wealth “is concentrated in too few hands”. Rising inequality and the fact that the “GINI index is growing in both developed and undeveloped countries” mean that a common agenda for development is even more necessary. “If this is not reversed, a significant part of the world will not have reached the SDGs by 2030”, said Vaira Vike-Freiberga.